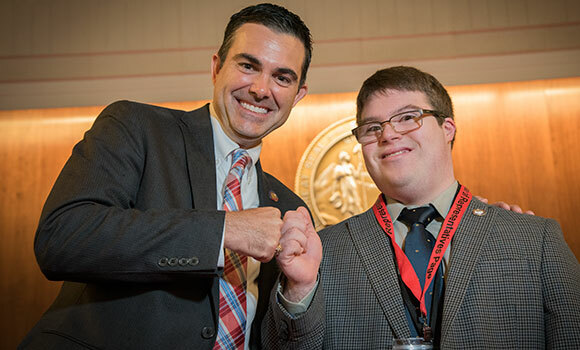 This summer, Paul Kocher made history as North Carolina’s first state legislative intern with Down syndrome. The first-year UNCG Beyond Academics student spent his summer working in Rep. John Bradford’s office helping with events, interacting with lawmakers and attending committee meetings. He’ll even tell you that he voted on the state’s $22 billion budget. “Paul has brought many smiles to many faces. He’s a ray of sunshine in a place that could use more,” Bradford said. Kocher’s favorite tasks were applying Bradford’s signature wax seal to constituent letters and navigating the tricky hallways of the North Carolina legislative building to deliver mail to three different offices. But the highlight of Kocher’s summer was attending debates on the House floor – a privilege reserved only for pages. With honorary page credentials, however, he was able to attend debates and votes. Bradford would look back at Kocher for a thumbs up or thumbs down before each vote. “That sense of responsibility gave him so much pride,” said his mother, Barb Kocher. Kocher met some high-profile individuals during his internship too. Not only did he rub elbows with state representatives on a day-to-day basis, he also met UNCG Chancellor Franklin D. Gilliam Jr. and hung out with Governor Pat McCrory during an intern reception. He also created a fast bond with Bradford and legislative assistant Anita Spence. As exciting as his summer was, Kocher said he’s even more excited about attending UNCG. He’s especially eager to live on campus. “Ever since middle school, he’s wanted to go to college,” Barb Kocher said. It wasn’t until a few years ago, however, that he heard about Beyond Academics at UNCG. Beyond Academics is a four-year certificate program of study for students with intellectual and developmental disabilities that emphasizes higher education, self determination, community inclusion, career development and independent living.